Aitchison, Hampson and Humphris are well-known Ladybird illustrators. What may be of surprise is that they were equally prolific as Eagle illustrators - and in the case of Frank Hampson universally acknowledged as Britains best comic strip artist, the creator of Dan Dare. From the unpromising beginning as an innovative Parish Magazine offshoot, Marcus Morris, a vicar with no journalistic background, intended the Eagle to address Christian values in an attractive and exciting way to young people - in other words as an evangelical tool. Amongst the writers was another vicar; Chad Varah, possibily better known today as the founder of the Samaritans and of course Frank Hampson who would become the chief artist and cover designer. After months of putting the product together in a bid for a publisher, Hulton Press finally bought the concept and the first issue went to press in April 1950. 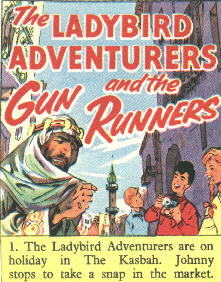 Considering the influx of Biblical stories and the anthropomorphic moral tales appearing in the ever-growing Ladybird title list in the early 50s, a Christian comic was not such an odd idea and rather reflected the post-war crusade of good citizenship and a return to values which may have been tossed about in the recent turmoil. 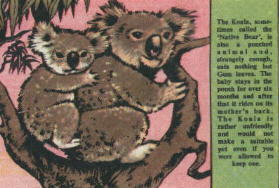 The Eagle had a disappointingly short run lasting only until 1970, although by 1962 it had begun its decline into takeover, and merging eventually with a rival - the Lion. Perhaps this echoed a more universal down turn in children's publishing including that of Wills & Hepworth into a modernised Ladybird format - sans dust-jacket, the dispatching of the tried and tested full page colour illustration format and finally losing its innocent idyllic charm as it succumbed to mis-directed political correctness, which ultimately only comforts careerist social engineers and political beasts. One of Ladybird's most prodigious artists was Martin Aitchison whose career with Ladybird spanned over three decades and included work as diverse as Puddle Lane, Dennis the Dragon, Great Artists and The Story of Metals. He was also the the artist responsible for Eagle's home-produced adventure serial 'Luck of the Legion' - a hard-boiled action strip set in the Foreign Legion and quite a contrast for the man who went on to illustrate Dancing Rhymes for the under fives! Interestingly, Aitchison has been deaf since contracting measles in childhood. Gerald Moore succinctly descibes Aitchison's skill, referring here to his cameos of the great composers 'The understanding of human character which inform this work and the vivid delineation of so many expression of the emotions are unparalleled in any other Ladybird Artist' and referring to him as Loughborough's Hogarth. However in contention, Hogarth-like he may be and excel in such like genre, but one must contest Aitchison's crown regarding true originality. That must surely go to Frank Hampson. Whereas Aitchison's ability to provide a wide variety of characters, and to maintain the essential human condition within the character, whether a soldier in extremis of combat, the rapture of Bach or the undiluted joy of a child at play, married with the technical skills of analytical drawing makes him a top class caricaturist, Frank Hampson provides an original voice. Certainly there are suggestions of Pop and the American Comic influence but his vertiginous take on the commonplace - a home interior or street scene and setting up historical tableaux into dream-like assaults on the senses made him an ideal candidate for the nursery rhyme series. Here he produced images which could be looked at again and again, rather like the repetitiousness of a rhyme where there are various allusions not accessible on first reading, such as referring obliquely to the territorial risk-strategy reality undepinning the Grand old Duke of York or the capriciousness of Mary, whose garden is surely a metaphor for her tragic court. No surprise really then that he illustrated the lives of the English Monarchs whilst concluding Dan Dare's future. Winter appears as a Ladybird house artist with a wide variety of work. Like Aitchison, his titles are curiously diverse: Learnabout Crochet, The Story of St Paul, Key Words Picture Dictionary. It is less easy to define a particular personality in his work and he is perhaps best described as a bone-fide graphic artist, working to commission, but producing work of a high calibre. He does not figure a great deal in the history of the Eagle but there is evidence of his work appearing in Swift (the little brother title of Eagle) in the early 60's and the supposition here is that he may well have cut his teeth on such publications before joining Ladybird. Robert Ayton was responsible for a number of well loved LB titles such as Musical Instruments and a variety of achievement titles, but chiefly and rather amusingly his work will loom large in the subconscious of those of us unfortunate to be born on the wrong side of the sexually enlightened 60s - as we made do as inquisitive ten-year olds with the end papers of Your Body. Ayton was the creator of the Eagle's Jack 'O Lantern. Readers may be hard-pressed to see any resemblence between this French pictorial epic and the great civilisation of The Aztecs. Frank Humphris was one half of a very successful collaboration with writer Charles Chilton for Riders of the Range and The Arizona Kid which featured in the Eagle. From all the names connected with Eagle listed here, Ladybird possibly owes more to these projects for its own titles on the Wild West - written and illustrated by Humphris in the 70s and after the demise of Eagle. In a radio interview in 1980 Humpris recalled his Eagle days and his love for the wild west. It was this work that allowed him to develop a keen interest in collating information and collecting 'Cowboy and Indian gear' that lead him to compile his own Ladybird series - possibly as a paid hobby. An earlier 'Battle of Little Big Horn' appeared in the Eagle. Humphris also illustrated titles such as Hannibal, Sir Francis Drake and the series on the Record breakers (Key-Words). Not an illustrator but a writer whose animal series appeared regularly in Girl magazine (sister title to the Eagle) as well as the Eagle and may be regarded as the house 'Nature Man'. Obviously highly respected in his field, Cansdale is even given his own foreword introduction in the Ladybird Book of Pets. He was also the author of British Wild Animals. This is a whistle-stop summary of works which have appeared in Eagle titles and Ladybird's book list. The theme is the connection between two highly successful children's literary projects and the parallels that can be drawn between them, not least the era they portrayed - a sense of charm and goodwill optimism on the one hand and the middle class cosy Christian idyll which masked the underlying cracks in society. By the late 60s not only had the Eagle lost its way, but Ladybird had lost its extra wrap and new technology in the shape of the domestic voice recorder allowed the screams of lost children to haunt us to this day.